What do you do when you are needing clients to be able to access your remote system, but your public IP address keeps changing? What if you could make it so that anytime it did change, it would email you and the rest of your users with the newest information. 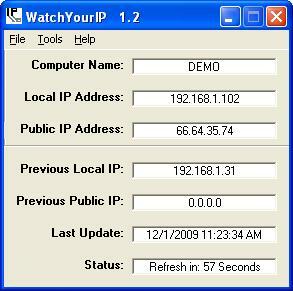 WatchYourIP is an IP monitoring software that will watch your Local and Public IP addresses and monitor them for changes. The software can be configured to email a list of users in the event of a change. Custom email messages can be created to say exactly what you want them to say to provide your users the correct information.